Jasmine flowers are often used to scent and add flavor to Green teas. 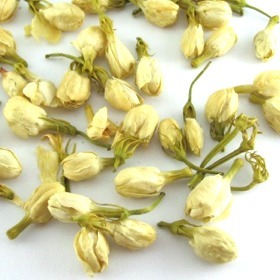 Jasmine Bud Tea is one of Chinese herbal tea consists solely of the small and beautiful Jasmine flowers that have yet to open. This produces a caffeine-free and sweet brew. It has been recorded that the Imperial Court of Song Dynasty used fresh jasmine flowers to perfume the emperor’s bed chamber. The lovely fragrance is known to have a calmative effects that soothe the nerves, while the Jasmine Bud Tea liquor is refreshing and has a cooling effect on the body. Sweet and delicate while the cornish aroma is soothing and very pleasant. Small, yellowish white jasmine bud. Very light yellow infusion. Fill 1 teaspoon of Jasmine to a cup (225ml) of boiling water. Covered and steep it for 3 to 4 minutes. The flowers will also infuse more lightly with lower temperature water. Use less flowers if the brew is too strong, discover your proper proportions as with any tea. Suitable for multiple infusions. I love Jamine teas and now I can add the flowers to any tea I choose. I also have the ability to add as many or few as I choose also. Very good flavor and quality! Im not a big fan of normal Jasmine Green Tea but this i quite enojoyed. I find normal jasmine tea quite overpowering but this is much milder than that and you can adjust the quantity to your own taste. It is refreshing & mild and excellent on its own or adding to your favourite green tea for a bit more oomph. I am not sure what happened with this tea, but it neither smelled or tasted anything like jasmine. I was very excited as jasmine is my favorite kind of tea, but this bears no resemblance to any type of jasmine tea or even jasmine scent I have ever run across. Very disappointing!